There is no end to the distractions in my life … It seems that despite claiming to want to travel and see the world, I in fact spend as much effort as possible trying to ensure that I see as little as possible. Beginning with the parsimonious breakfast and syrupy coffee, I launch on the usual tangent about utterly irrelevant and incongruous subjects. What’s more, I want to do two things this morning prior to subjecting myself to another round of temples in the blazing heat – see if we can source some sort of USB reader, and head off some place with decent coffee for a round of post card writing. The attempt to get a USB-based reader misfires badly as I trundle from one cellular shop to another, not that the effort wasn’t misguided to begin with. The USB reader is intended for my guide Kyaw, but then as I rifle through his personal belongings, it turns out he already has exactly what he needs. The post card writing session is even less exciting, but I have made a commitment to my once enormous and now rapidly diminishing social circle. In any case, I will have more time here than in Yangon, which I imagine will be quite hectic. Trundling along the road towards Old Bagan, I reach the golden dome of Shwe Zigon Zedi, an old temple complex almost inside the town of Nyaung U, and built much later than the temples from the classical period in and around Old Bagan. 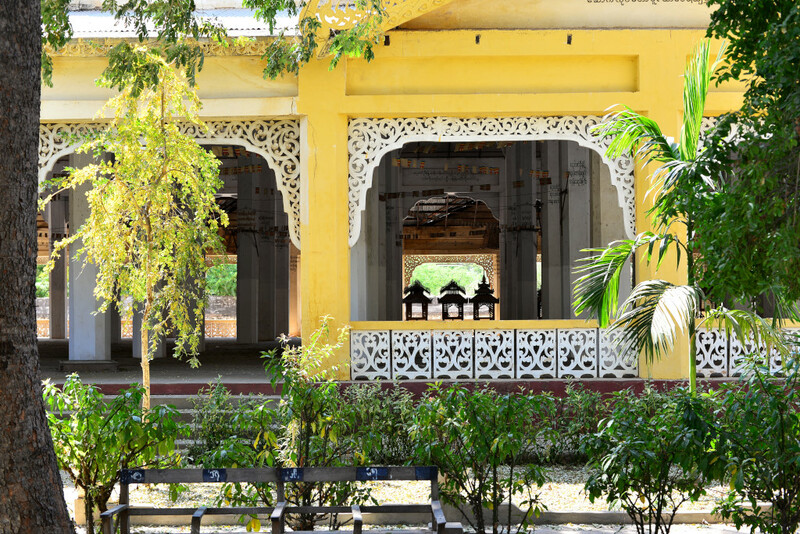 Approaching the temple across a dusty field, we are met by two large white stone chinthe or guardian lions, the complex itself comprising numerous structures, including a smaller pavilion with the classic steep Burmese tiered gables lined by elaborately sculpted golden bargeboards. 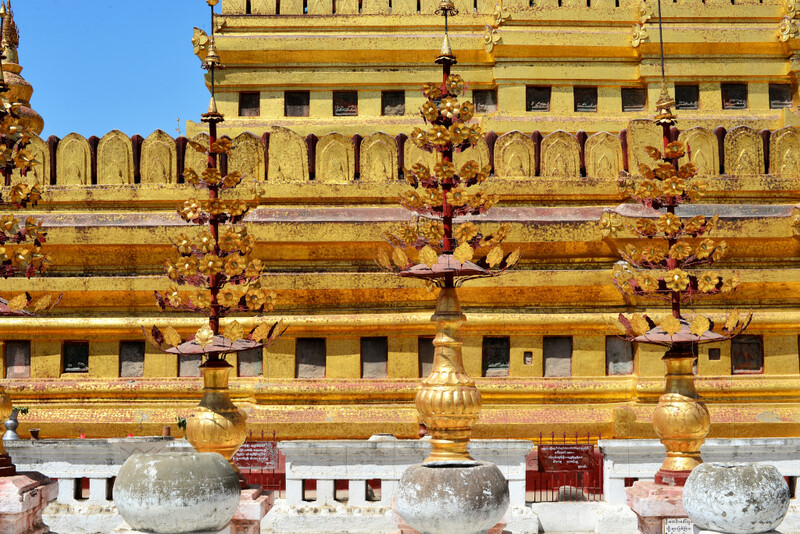 Synthetic ornamental flowering trees line up along the flank of the golden stupa, stairs leading up to false porticos on four sides of the central dome. 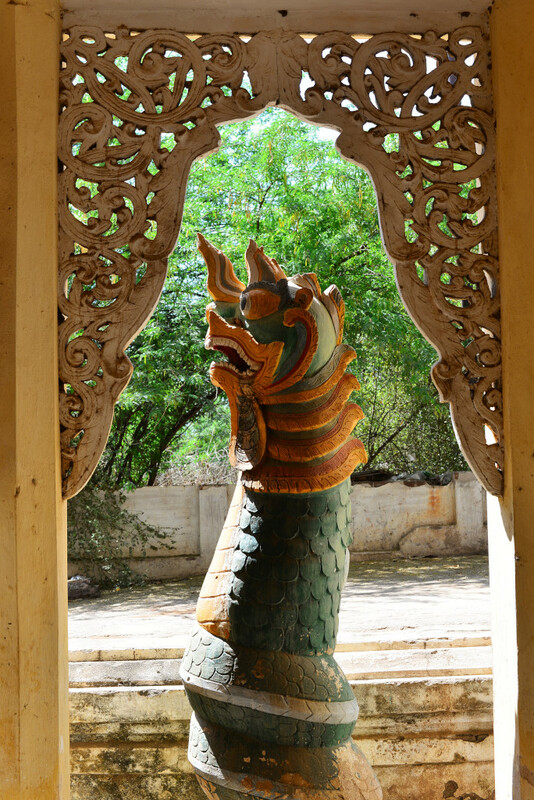 The long arcaded passages guarded by stylized naga radiating from the central stupa are suitable for walking in the intense heat, unlike the exposed exterior plazas, blazing hot in the mid day sun. 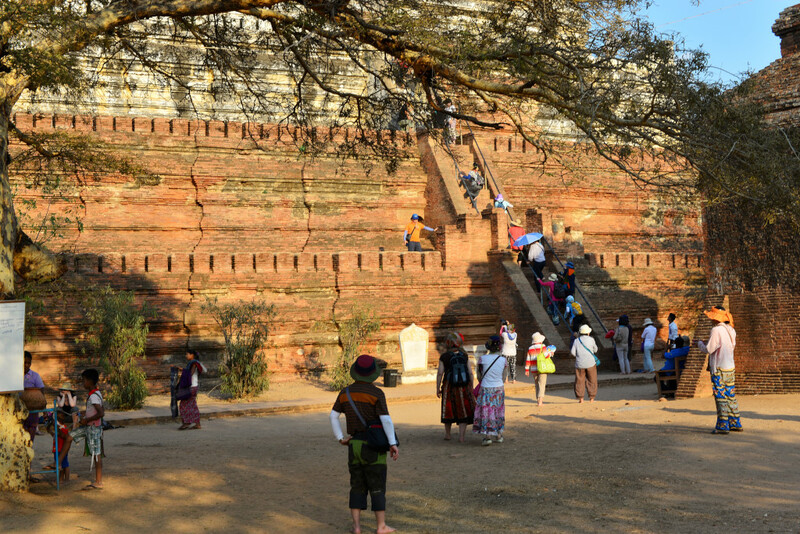 The visitors circumambulating the stupa run from one set of shadows to the next to avoid burning their feet. In the side passages, vendors sell intricate wood carvings, dolls, prayer beads, lacquered tablets, carved animals, baskets, woven fabrics, and parasols. They are virtually catatonic from the heat, but forced to stay on in their daily bid for survival, all the while their children romping indifferently on the grounds, immersed in their own world. 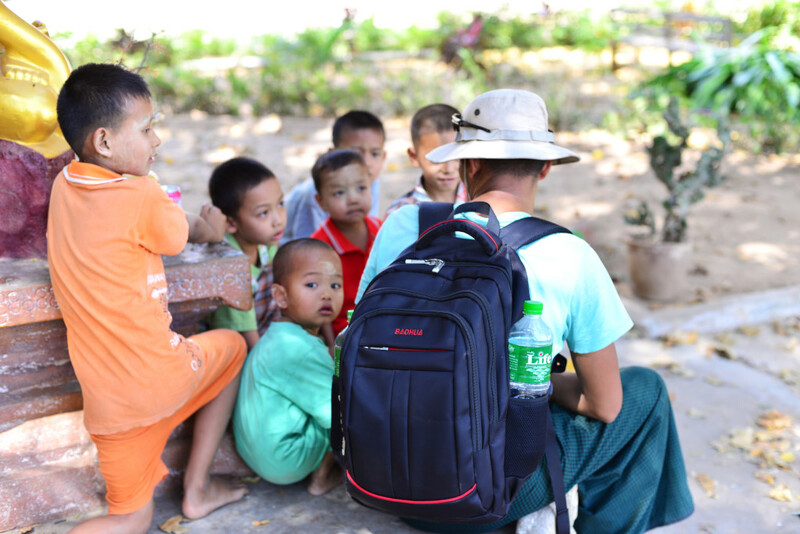 But my guide Kyaw keeps the children busy, the love for children being a universal constant in this more traditional culture. 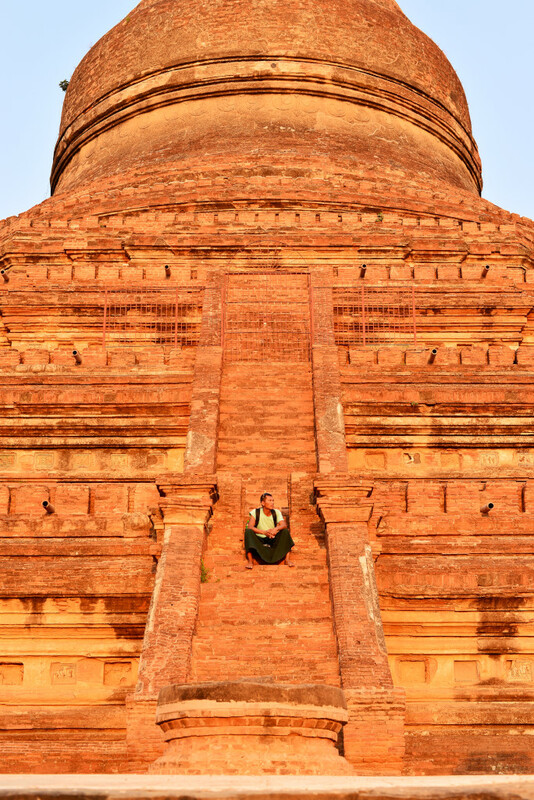 My goal for the day involves visiting the large temples immediately south of Old Bagan. 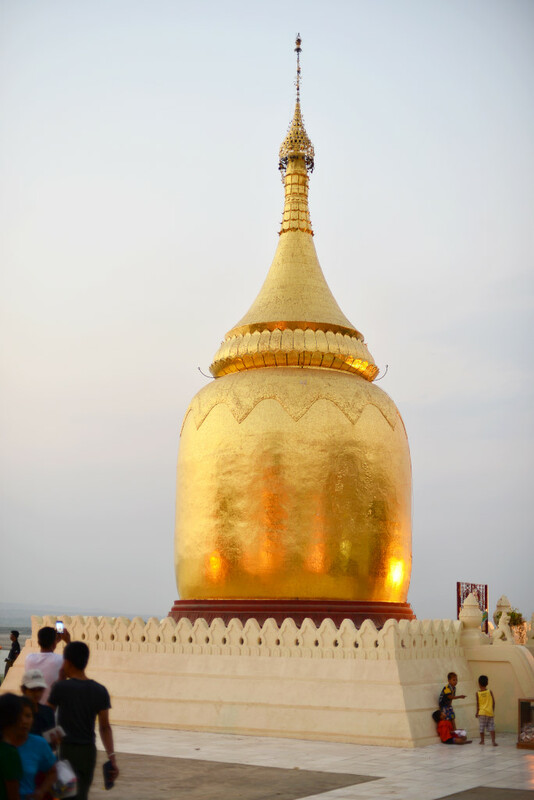 En route, the Khay Min Gha Paya comprises of nothing more than a set of small stupas nestled together in the brush near the main road, a few bougainvillea adding colour to the earth and olive tones of the stone and surrounding scrub. 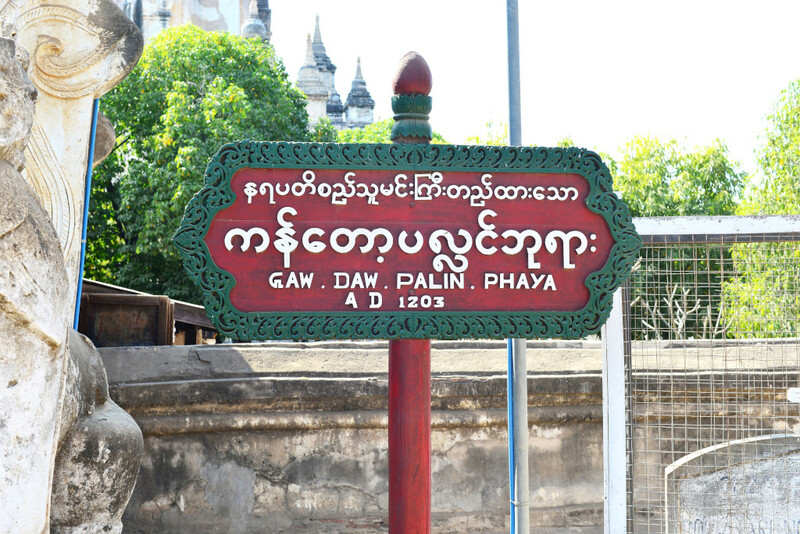 Just inside the old city walls, Gaw Daw Palin Phaya is a towering, Disney-like structure that attracts the crowds of locals, the plaza around the temple baking hot, with a smattering of vendors selling the local cherries, bananas and drinks. 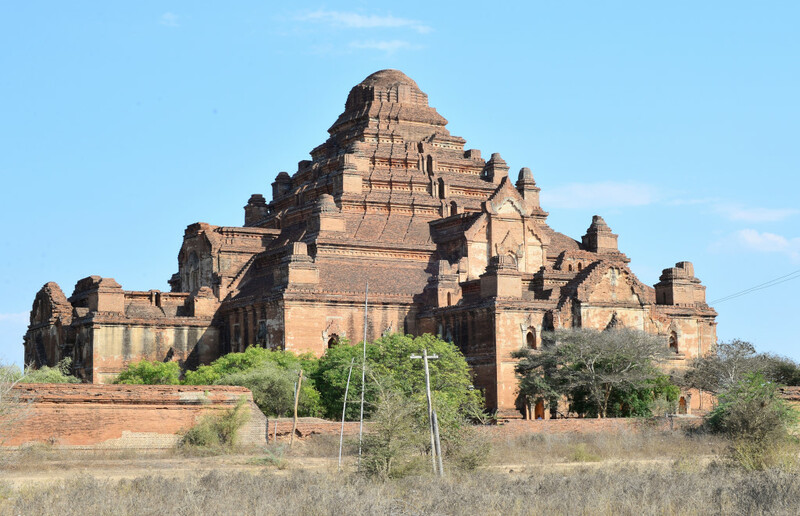 A digression into the history of Bagan, paraphrased from Wikipedia. 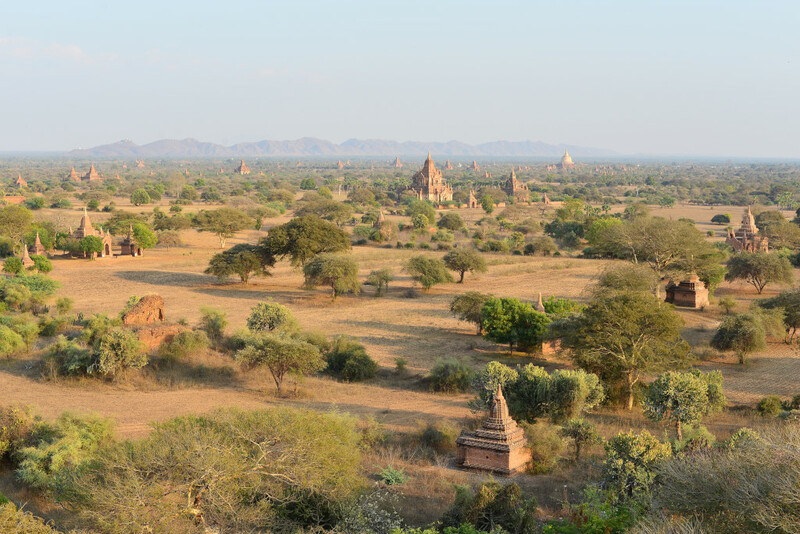 From the 9th to the 13th centuries, Bagan was the capital of the Burmese kingdom, a time the Burmese culture reached its apogee. 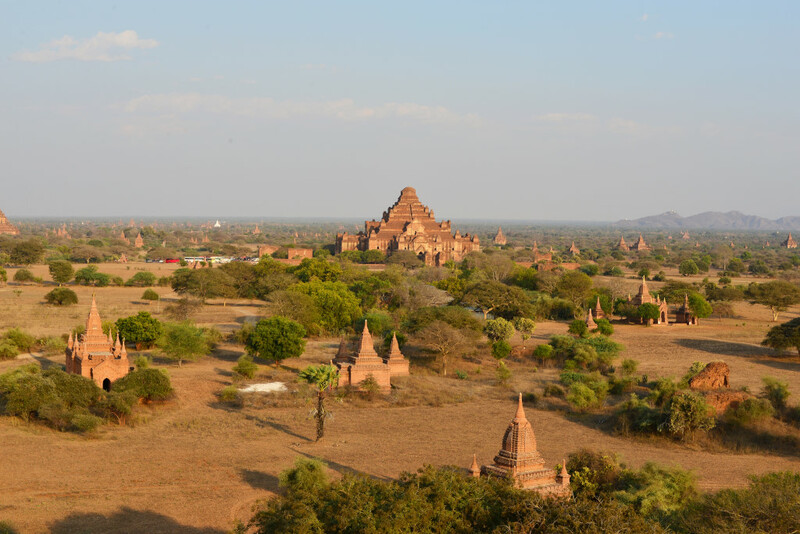 Bagan represents one of the most important archaeological and cultural hot spots in Asia. 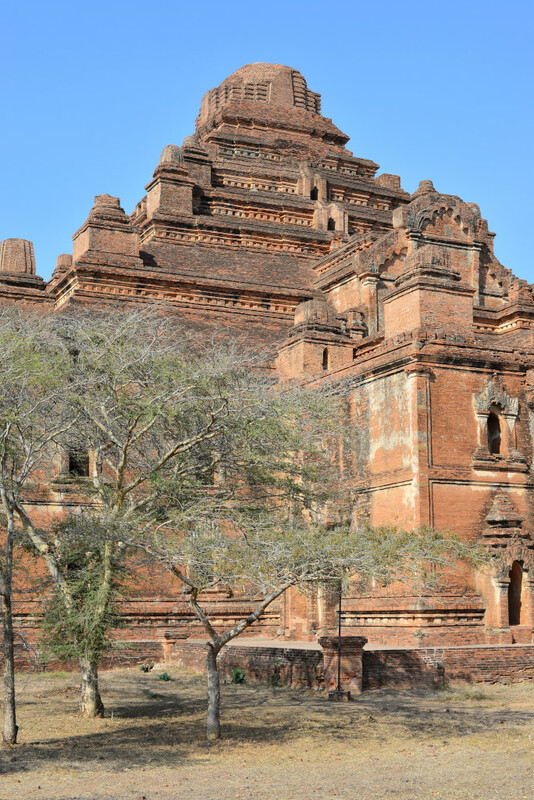 Over 10,000 Buddhist temples, pagodas and monasteries were originally constructed in the 40-odd square mile territory at the peak of the Bagan era, of which some 2,000 remain today. 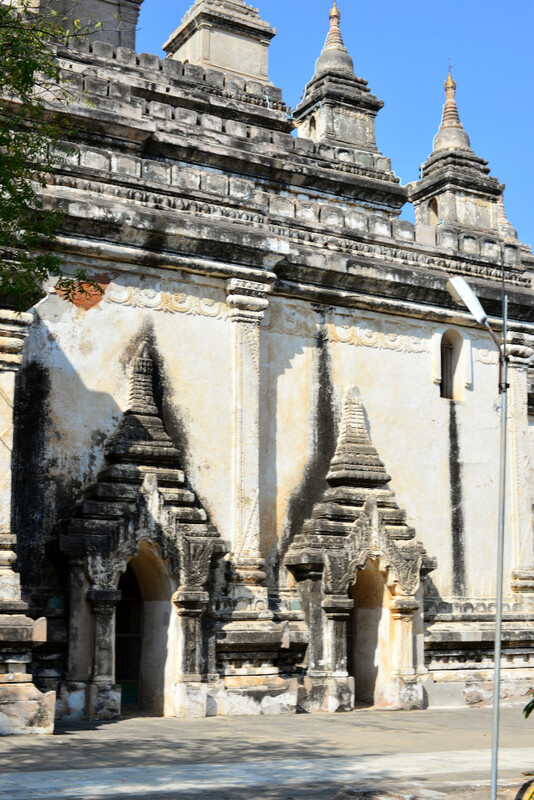 The city was apparently founded in the mid 9th century, when it rose to prominence and dominion over the Burmese region. 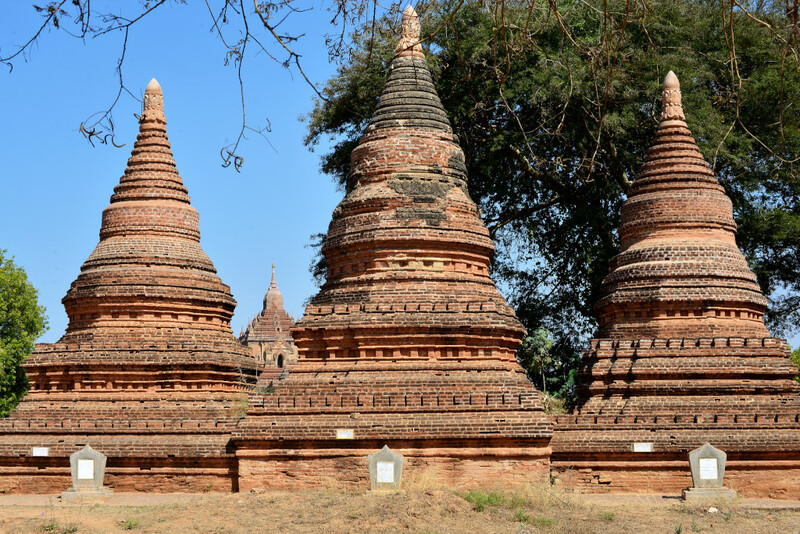 In the coming centuries, it assimilated the Pyu city states that represented the political and social foundation of Irrawaddy-focused societies. 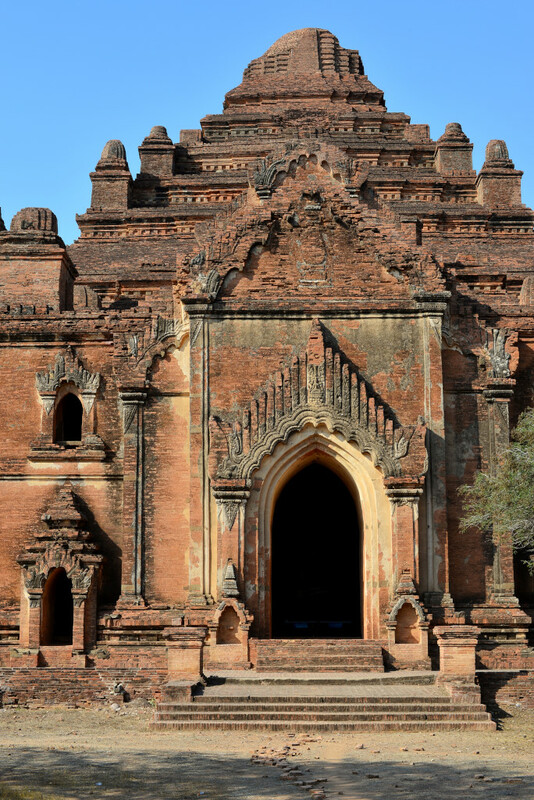 Bagan grew to a degree of prominence that attracted students from India, Sri Lanka and the Khmer empire for the study of philology, medicine, law, philosophy and other pursuits. 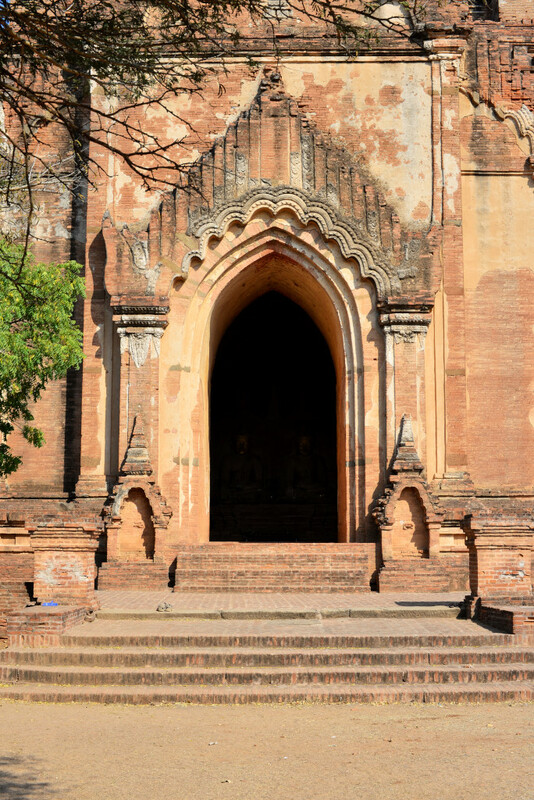 While Bagan also achieved substantial significance in the Buddhist world, the culture of faith promulgated was largely unorthodox, combining a blend of earlier Theravada Buddhism with Mahayana Buddhism, Tantric Buddhism, Hinduism and animism, a degree of openness that disappeared upon the downfall of Bagan, and was never to return. Back to the Gaw Daw Palin Phaya. 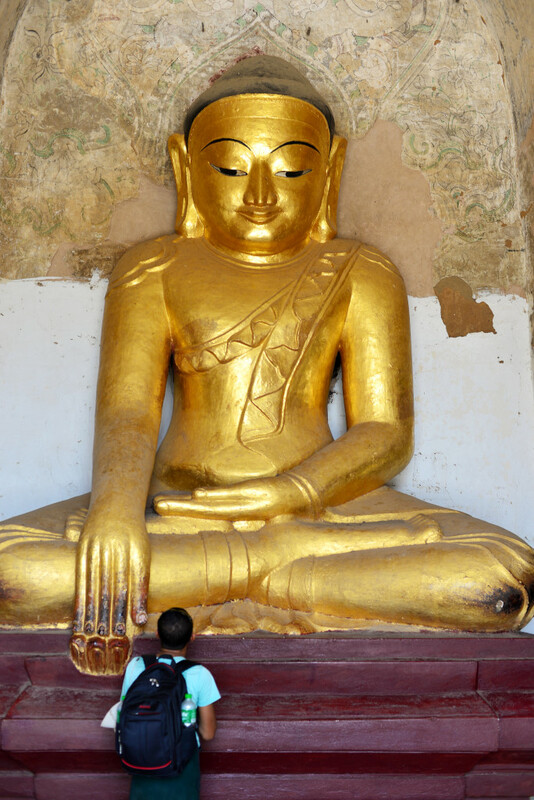 Cross-legged golden Buddhas occupy interior platforms facing each of four cardinal directions, in the typical Bhumisparsha mudra, all five fingers of the right hand extended towards the ground, symbolizing Buddha’s enlightenment, with the left hand held flat in the lap, symbolizing the union of method and wisdom, samasara and nirvana. 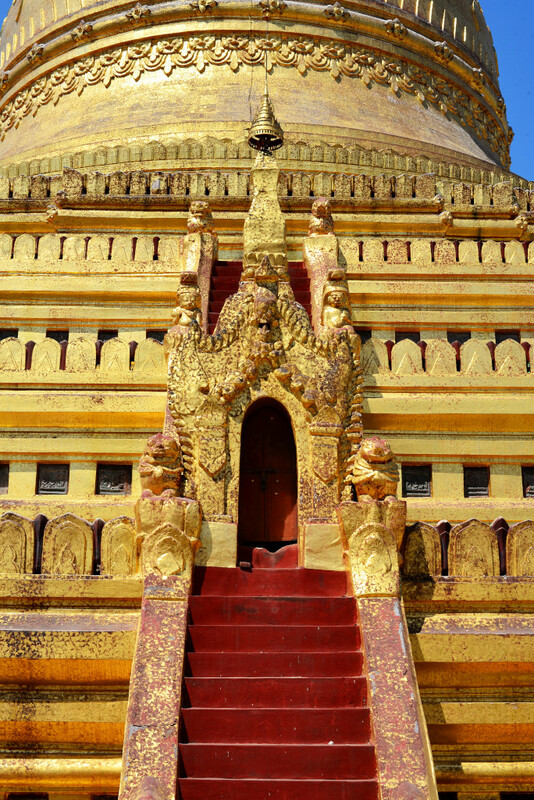 Pagoda-shaped exterior arches line the ground level of the exterior and rise steeply in the form of false porticos towards the summit. 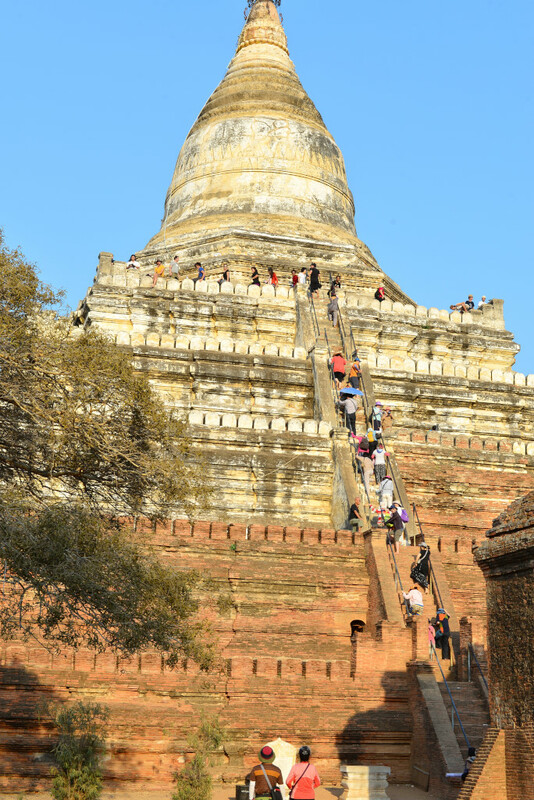 Then off to the Dhamma Yan Gyi , a giant stepped temple almost reminiscent of a huge Mayan temple, with enormous porticos extending from the base in four directions. The structure is so large that the terracing towards the summit creates an impression of being sloping, although the apogee of the building is achieved through a succession of right-angled inclines. These bicycles are terrible on the sandy soil, never mind being far too small. I am so fed up with skidding around in the sand, worried about the chain jumping, the intense heat, sand getting in my eyes, it’s just not fun anymore. Trudging through the scrub to get a better shot of the structure from some distance, highly adhesive tiny thistles stick to my clothing and skin, then disintegrate when trying to remove them. As I slowly advance towards the back of the building, a bolt of pain in my right foot adds to my already substantial level of discomfort. I look down at my right foot and see a long thorn jutting through my blood-soaked sandal. I sit down in exhaustion: I am not really in the mood for this, and not sure I can take much more. I limp over to the entrance to get some water to allow me to wash my feet. I daren’t enter in bare feet looking for the water pitchers that are usually found inside temples as I may augment risk of infection, never mind tracking blood over the stone. Happily, it turns out that the cut is only superficial, and after my foot has been washed it stops bleeding. Whatever minimal desire I had to actually visit the temple is long gone. I am happy to limp around the outer platform until reaching the primary entrance. 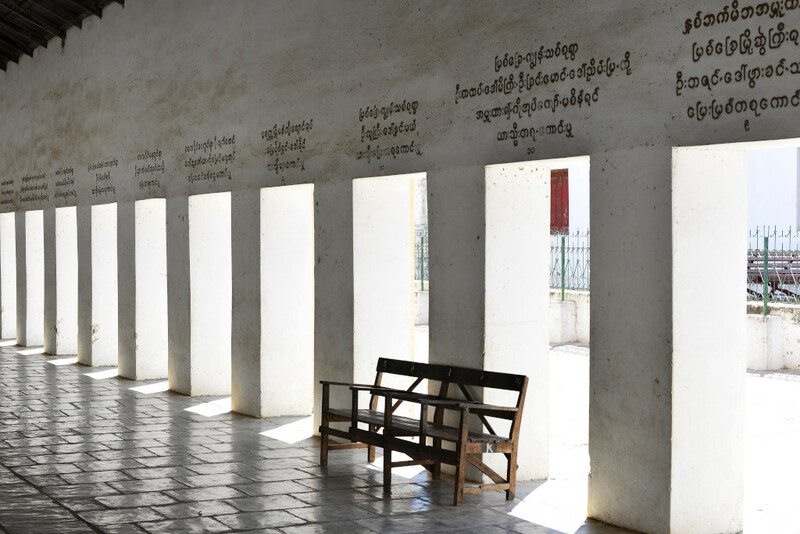 I am admonished for taking water from the sheltered tureens outside the temple to wash my feet, as the water is exclusively for drinking, and using it for anything else is considered offensive to the Burmese. On one hand, I am in a state of panic at the possibility of getting mild heatstroke and dehydration, but on the other, I am absolutely not going to pay the inflated prices the vendors are asking for drinks! At the far end of the lot, away from the tour buses are a few food stalls somewhat unclear as to their offering and hence intended to keep the foreigners away. Apparently, they make salads, and that is just fine with me in this hot weather, not that I can keep myself off the jasmine tea. 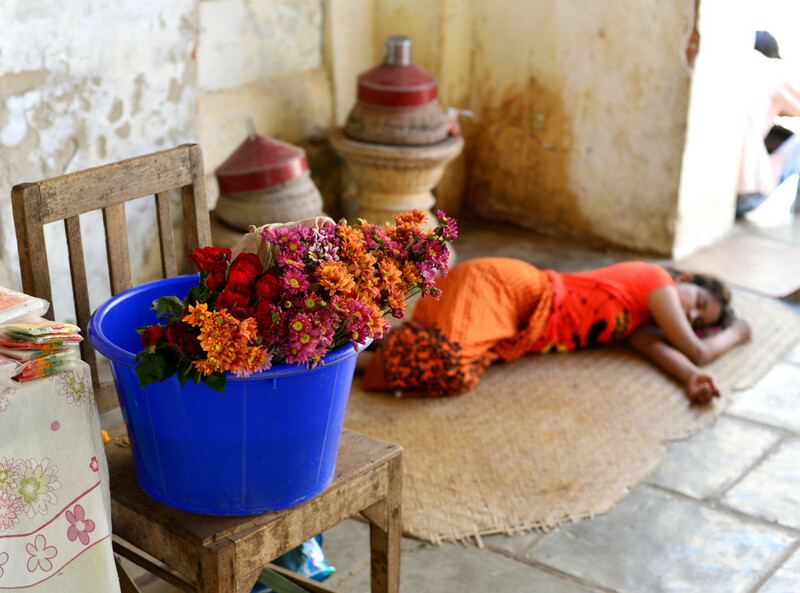 Locals seem drink a lot of tea, less so water, being accustomed to the heat. Ambling along the sandy trails somewhat further to the south, I arrive at the Shwe San Taw paya, which also happens to be one of the primary designated locations for observing the sunset, a romantically appealing idea if it weren’t for the crowds already onsite now that late afternoon is approaching. These growing crowds give an indication of how many people could actually be swarming over this structure when the sun actually sets. To make matters worse, the staircases leading up the tall structure are extremely steep, and without lighting, I am not convinced of the safety of larger numbers trying to get off once the fun is over. 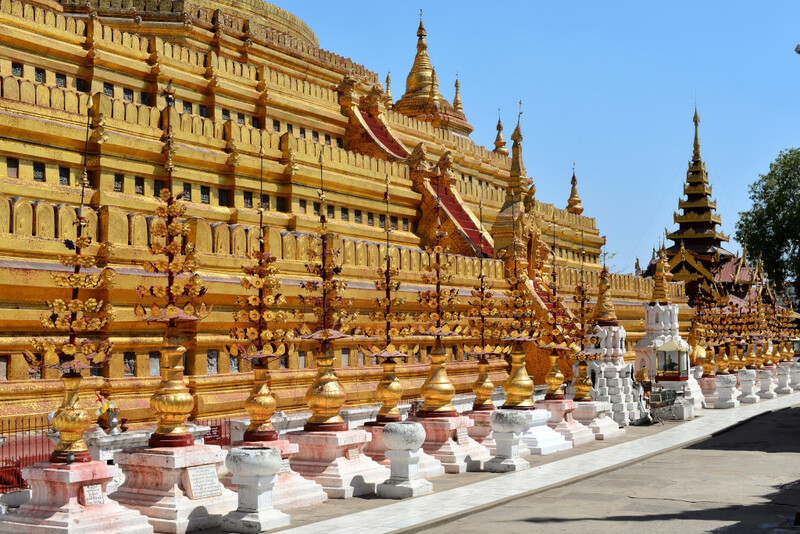 Nor am I necessarily enthralled with the somewhat silly ambience on the upper terraces, having to listen to the usual discussions of the country’sights being enumerated from the same old list, including Yangon, Lake Inle, Bagan, Mandalay, Hsipaw, and Kalaw. Of course, it’s not like I’m not going to visit all these places! The views from the top are certainly spectacular, and the sunset will be fantastic to view from up here. Strangely enough, there are actually wardens checking for tickets at the temple, one young German woman being aghast at having to pay $20 for the privilege. She had no idea you had to pay admission at Bagan, as she arrived at night, and now they want $20 U.S. ‘That is outrageous!’, she tells me. 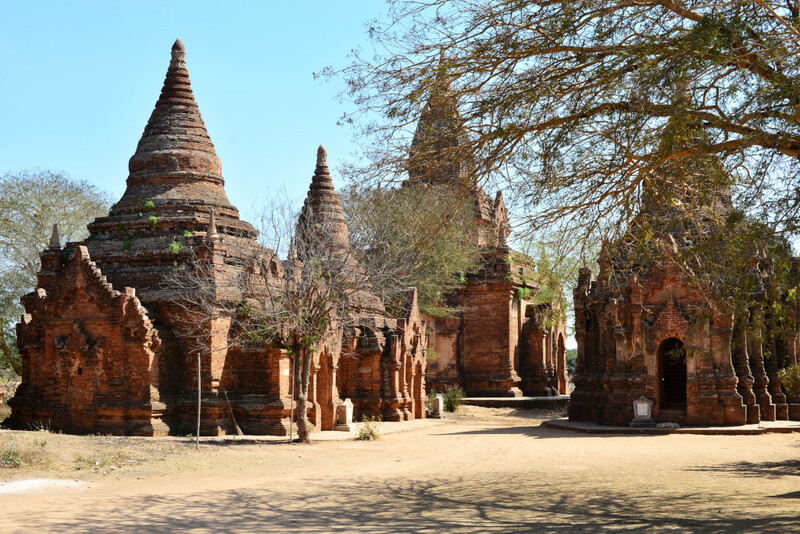 Really – for one of the most important archaeological sites in Asia? I won’t argue – she is free to leave, although I really wonder how poorly run Bagan is that admission is otherwise virtually never checked. Given the circus building at this site, I want to just take some photos, enjoy the moments while I am here – and leave. I find tourist attracts reduced to this degree of ridiculousness difficult to contend with. There is not a lot of time left in the day, and I would love to see some more of the temples before the day is over in finality. 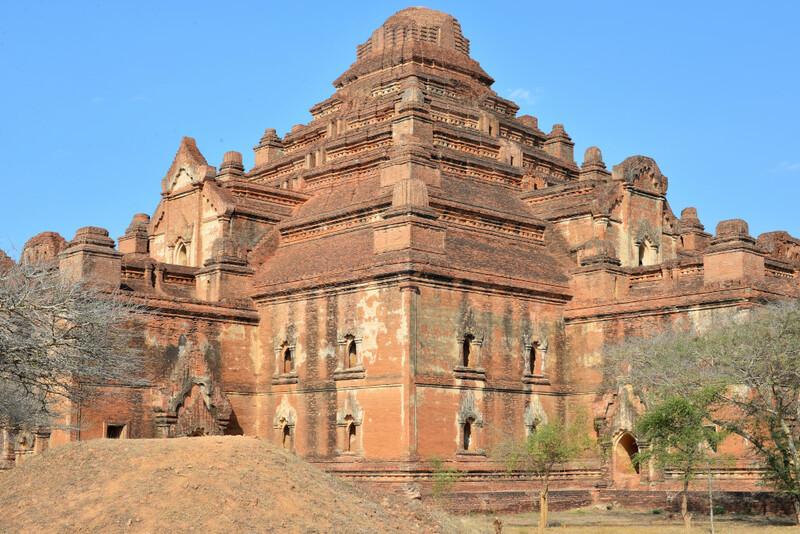 The Mingalar Zedi closer to the river presents an entirely different affair, the bulky ziggurat-shaped temple crowned with a bell-shaped stupa all of the same brick, a uniform burnt terracotta in the afternoon sun, and completely abandoned other than an older French couple. The lower platforms are accessible to the public, but the stairs leading to the upper levels gated, hence none of the prized sunset views are obtainable here. The structure, its drama and shimmering colour make powerful impressions, even though I stay very briefly. But now I have a change of heart, and do want a shot at the proverbial sunset photos! I am thinking that the jetty on the Irrawaddy river in Old Bagan may be a good place to see it. 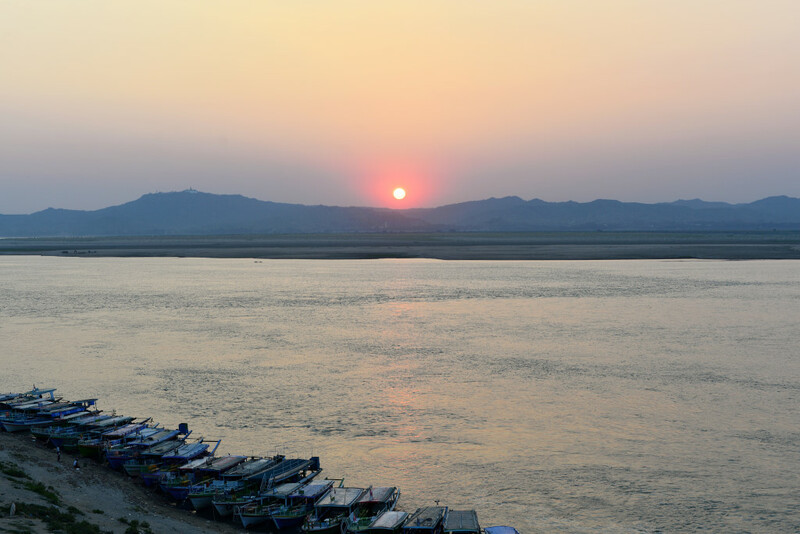 Pedalling furiously on the undersized bicycle, I reach the entrance of the Bupaya crowded with parked cars and motorcycles, a small golden-domed stupa overlooking the river just as the brilliant orange disk of the sun descends behind the low hills on the opposing side of the river. Behind us rises the white disk of the moon, almost full. 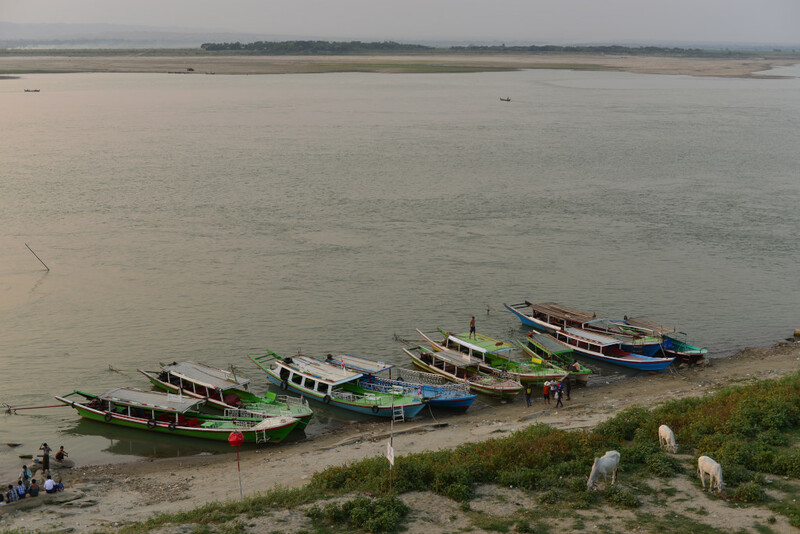 A small group of mostly older tourist collect by the low wall with their cameras poised, the wooden touring boats nestled against each other along the river banks below. A conversation with an older couple from the Ticino in Switzerland ensues, discussing the desire to see the remnants of authenticity on the part of cultures on the brink of modernization, ostensibly becoming wealthier but also losing their uniqueness and singular spirit. Of course, it’s people like us who are on the forefront of wanting to consume authentic culture and at the same time being responsible for destroying it. I would like to take a last opportunity to look at the more refined arts and crafts on offer in some of the shops en route, but am inevitably drawn into the Nanda restaurant, where a live marionette show is taking place with live musical accompaniment. The performing art formerly unique to Bagan is apparently now only being presented to busload upon busload of tourists at the Nanda in one of two alternating seating spaces with dedicated stages each evening. Considering the number of people attending and the prices in the establishment, they can only be profiting very handsomely. The brightly-coloured puppets stride, dance, intertwine and somersault across the stage under the artful manipulation of the puppeteers, the performances involving skits taken from Burmese tradition. The music is centred on the percussive use of a set of conjoined metal pots in the style of a gamelan, with accompanying drone flute and strings. I would like to secure some seats in the area the next performance will take place, but by the time we move to the alternate seating area, it has already been largely occupied by another onslaught of tour groups, and the only possible tables would be in some corner far from the stage. But despite everything, the dramatic traditional puppet show offers a spectacular insight into Burma’s rich cultural history. 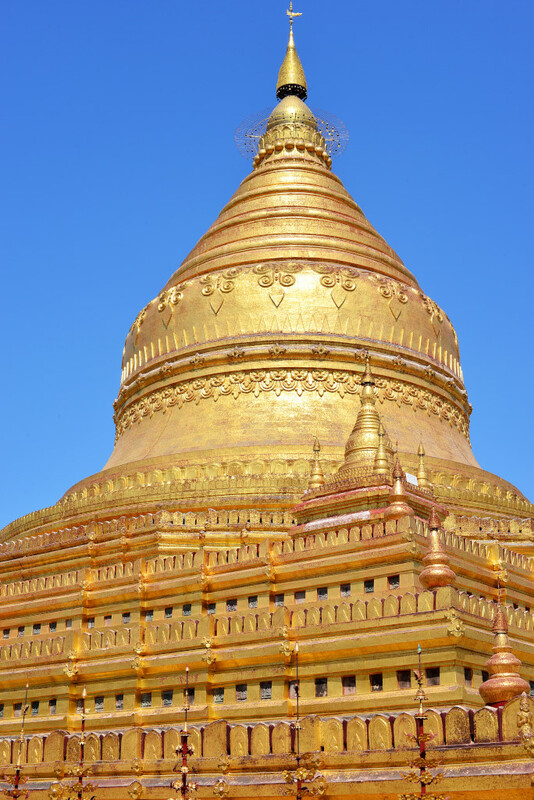 And the experience is particularly special for my guide Kyaw, since he is Burmese and very interested in his culture, and yet has never had the opportunity to see this kind of thing before.